Town of Dillon, lake front living in the Rockies. Some of the best inland sailing ever. If you want lakefront property this is the place! 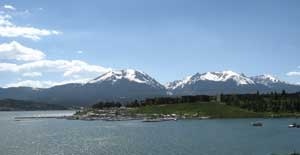 The original town of Dillon sits at the bottom of it's namesake lake but when they relocated it was an upgrade. The lakefront views are framed with a backdrop of spectacular Rocky Mountain Peaks. The whole town is convenient to the Marina and the bike path that circumnavigates the entire lake. You can rent boats and take lessons at the marina. Next to the marina is the amphitheater where they have free concerts all summer long. The town is also host to some wonderful shops and restaurants as well as summer festivals, concerts and the largest farmers market in the area. Along the waterfront is a multitude of lake view properties. Most are blessed with pools and hot tubs. Walk or bike out your door and enjoy the lake and the mountain scenery. Also located close to five major ski resorts Dillon is a great place for your ski vacation as well. The free Summit Stage bus systems stops in town and will take you to any of the resorts. Also, if you want to stay in there is a nice movie theater and the factory outlet stores are just down the road. 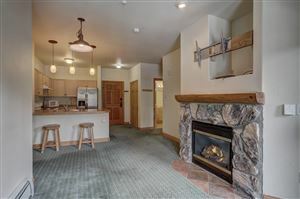 Summit County listings last updated Apr 19, 2019 9:04:pm.